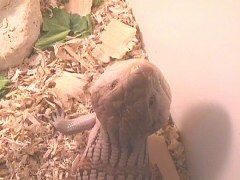 This care page for Northern Blue Tongue Skinks is designed to give the new potential owner a general idea of the basic care involved in keeping blue tongues. Caging Requirements *Newborn blue tongues can be kept singly in a 10 gallon aquarium for a short time. But since they grow amazingly fast it's best to go ahead and obtain a minimum of a 40 gallon aquarium so you don't have to upgrade once your blue tongue reaches full size of 18 to 20 inches. Substrates *Aspen bedding is the prefered bedding for blue tongues since they enjoy the chance to burrow and hide. Also, aspen bedding is the only wood product bedding that isn't harmful to your skinks. You can also use newspaper, but you MUST provide a hide box for your blue tongue to feel secure. Live/Meat foods * High quality canned dog food, crickets, mealworms, pinky mice (for adults only). Make sure that if you use dog food that the protien level is low and don't use any foods that contain fish. Lighting *As with most reptiles, there has been little or no proof that UVB has any effect on reptiles. I personally use UV flourescent tubes for my blue tongues, but only because I always have extras from my bearded dragon enclosures. Try and take your blue tongue outside occasionally to get some sun, and you should be OK with using standard flourescent or incandescent bulbs as long as they get the warmth they need.